This post was written in January 2013. Since then, Bandcamp has continued to improve their built-in music discovery (which means there are even more reasons why you should give fans the opportunity to buy your music than the still relevant reasons mentioned below). If you want people to be able to download your release for FREE, don't do it as a straight up "free download", but rather, set your pricing to a $0 minimum and "let fans pay if they want". By setting the pricing up as "Name Your Price, No Minimum" your fans can still enter $0 and get your release for free—so you don't need to worry about feeling like a capitalistic pig. All you are doing here is giving the people choices. And people like choices. If "free download" is the only option available to someone visiting your album page, then you have not only taken away that fans choice of showing you a little financial appreciation (believe it or not, those people are out there), but you have also taken from that fan the possibility of being able to add your release to their Bandcamp Collection (a collection they'd always be able to access on the go with the Bandcamp App). And if that wasn't reason enough, the "free download only" limitation also takes away a fans opportunity to write one of those glowing little reviews that you sometimes see sitting underneath an album (which some hip people have started referring to as "#Fandcamp"). 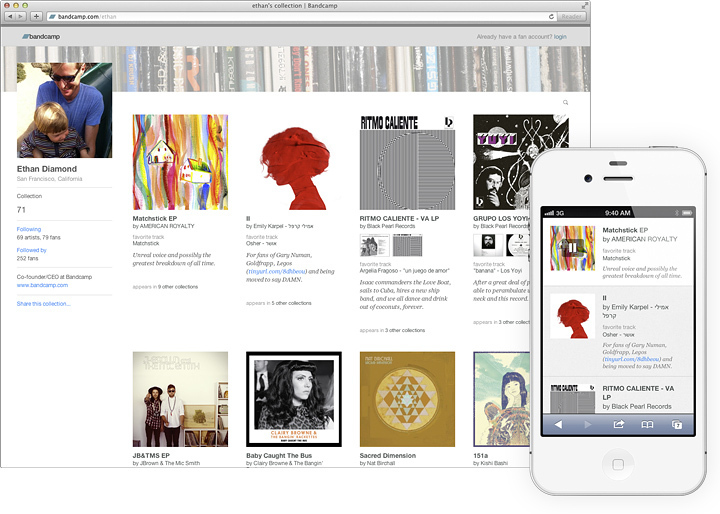 Gone too is the possibility of someone else discovering your album while checking out another fan's Bandcamp Collection (here's my collection if you want a biased taste on how great a discovery tool these can be) or your album being showing up on the music discovery gold mine that is the new Music Feed. 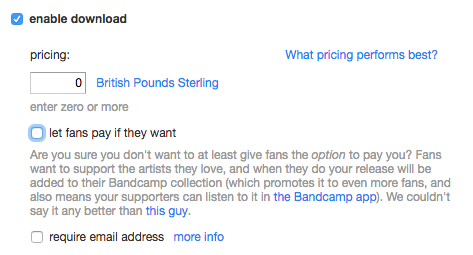 Even if Bandcamp didn't launch fan accounts, it's still a better move to at least give people the option of supporting you for your work if they want—even if you're perfectly fine with them having your creations for free—because sometimes it is nice to be able to pay for the day's coffee with the coinage you earned from your art. If people can only select FREE they will always select FREE; let the people select $0 or more, and they won't always select $0. And that has benefits for you and them. Everybody's happy. Want an example as proof? Just the other day, me and Benjamin Shaw were talking about how these new fan accounts were making us want to go buy music we already had and Ben mentioned how he asked a friend of his to change an album from "free download" to "name your price" so that he could pay money for the album and add it to his collection. I told him how I had experienced the same desire of wishing I could buy an album that was only available for free. And then we both laughed out loud about how insane that sounds. And I'm sure me and Ben are not the only crazy ones.